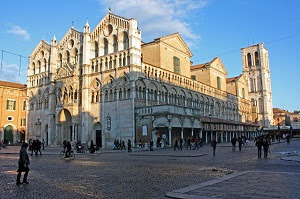 Ferrara has one of the best preserved medieval historic centers in Europe and was declared a Unesco Patrimony in 1995; a classic Italian Renaissance town characterized by its walls, alleys, gothic churches, the Jewish Ghetto and Synagogues. The Este Dynasty ruled this city for 350 years contributing the Castle, the Erculean Addition, the urban expansion created in 1492 by the enlargement of the walled city limits celebrated as an example of renaissance urban planning, and many works of art, paintings and letters. The Estensi cultural contributions began in 1391 with the founding of the university that led to visits to Ferrara by humanists, scientists and artists including Piero della Francesca, Tiziano, Mantegna, Copernicus, Pico della Mirandola, Pietro Bembo, Ariosto and Tasso. 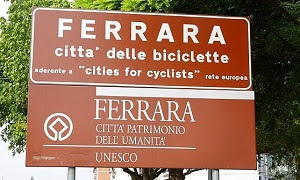 The Ferraresi preferred mode of transport is the bicycle and the local culinary specialties range from the coppia ferrarese bread to pasticcio di maccheroni, a dish that dates back to the time of Lucrezia Borgia, salama da sugo and cappellacci di zucca. Piazza delle Erbe features sidewalk 12 meters wide and 120 meters long and is the site of Ferrara’s fruits, vegetable and other outdoor markets. Around it are the San Giorgio Cathedral, the Medieval era City Hall and courthouse Palazzo della Ragione, the Loggia dei Merciai where wool and other cloths were traded, and the unfinished bell tower by Leon Battista Alberti. Schifanoia Palace was built during the 14th Century and expanded in 1470s. The name, mythology and astrology frescoed halls imply a place of entertainment where you are not likely to be bored. Corso Ercole d’Este is a pedestrian only avenue that preserves the renaissance features of building facades, doors and windows. 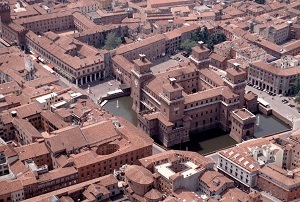 It passes the Quadrivio degli Angeli is the meeting point of the Diamanti, Turchi di Bagno and Prosperi-Sacrati Palaces. 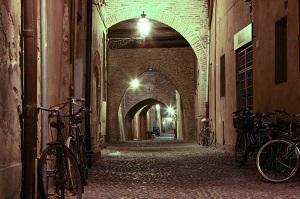 It ends at Ferrara’s ancient city walls. 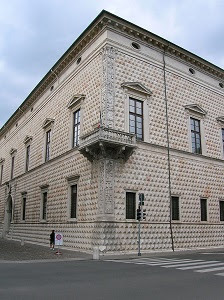 The Diamanti Palace dates back to 1493 and is so named for the 8500 white marble blocks used to decorate its exterior while the interior features a renaissance courtyard with cloister and well. The Ferrara National Picture Galley is on the first floor and holds works by Cosmè Tura, Andrea Mantegna, Ercole de Roberti and Dosso Dossi. The Medieval Town via delle Volte winds for two kilometers in Ferrara’s historic center and was a major commercial artery with goods stored on the Po River waterfront, easily reached through the maze of alleys and arches. The warehouses are now apartments and restaurants. 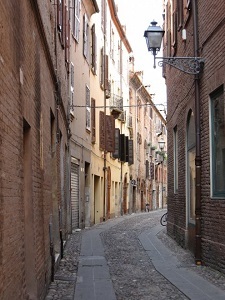 The Jewish Ghetto is characterized by alleys, artisan shops, old fashioned food stores and the Jewish cemetery.